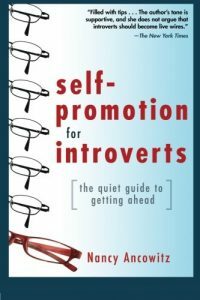 Nancy Ancowitz is a coach specializing in career advancement and presentation skills and author of Self-Promotion for Introverts®: The Quiet Guide to Getting Ahead (McGraw-Hill), a Publishers Weekly “best book” selection, which has been translated into multiple languages. The book offers a gentle, but results oriented, approach to helping those who talk less get heard more. She is an adjunct instructor at New York University, where she teaches Presentation Skills for Introverts®, Self-Promotion for Introverts®, public speaking, business writing, and other communication skills; she’s also spoken at the Smithsonian Institution, the US Navy, the National Institutes of Health, New York Life, the Institute for Supply Management, and a wide range of other corporate and professional organizations. Nancy blogs for Psychology Today and Salary.com, and she has written for The New York Times and The Wall Street Journal online.